These funky and well equipped city apartments put hip and happening city breaks back on the agenda for culture-starved parents! Splendom Suites is an exciting concept that means families can do Barcelona and Madrid in style even with a baby or toddler in tow. For around half the price of a hotel in the same area, the Suites offer families home from home comfort, space, kit and caboodle, with the designer style. Plus there's daily maid service and a concierge on call for helping plan activities, source daily needs or even book babysitting. Splendom Suites Barcelona is handy for the city's central sights, located in the Art Nouveau 'Barrio del Eixample' quarter around 15 minutes walk from the Placa Catalunya in the heart of the city. 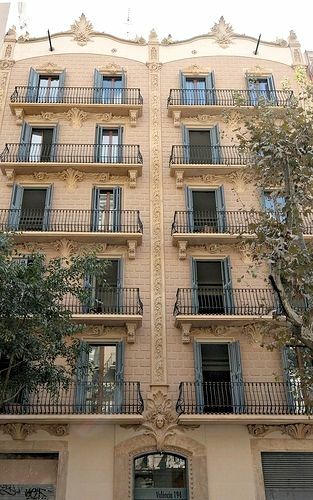 Architecture enthusiasts will delight in the 1906 building which has a grand and ornate facade, listed in the Artistic Registry of Barcelona, and shuttered French doors from the suites onto safely enclosed, wrought iron balconies or spacious roof terraces (there is a lift). 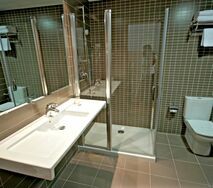 The building was renovated in 2007 in cool modernist style and the suites transformed into sophisticated apartment-style accommodation, with 24-hour reception desk, flexible housekeeping services and, a saving grace for baby bedtime-bound parents, a cafe with room services. Families can even make use of a 24-hour snack room with Nespresso, orange juice, infusions, fresh milk, yoghurts and pastries – handy for late night munchies or early bird brekkies. 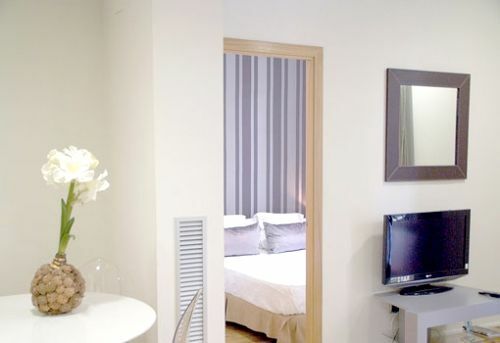 Staying at The Suites means the luxury of around 55-70 square metres of space to chill out and enjoy Barcelona at a stress free pace, eating in or eating out to a flexible, family timetable. A stunning living dining area features Philippe Starck furnishings and little ones can watch their favourite DVDs on the LCD TV, which also has satellite channels. 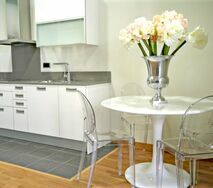 The compact, state of the art kitchen is equipped with a fridge freezer, oven, microwave and washing machine so that's baby mealtimes, fussy eaters and messy monsters sorted, plus a ‘Culture Customisation' service means guests can specify international extras from an American coffee machine to chopsticks. The Suites have one or two glamorous bedrooms with classy, bold decor and luxurious linen then the super sleek bathroom includes a walk in shower and designer fittings plus luxurious Molton Brown toiletries. The Suites have free wi fi connection and guests have complete control of the air con, heating, smoke detectors etc from a smart panel. Really helpfully on the packing front, a free family kit can be provided comprising high chair, cot, baby changing table and toys. Splendom Suites is certainly a swish and practical option for a baby friendly Barcelona break but the brand has pretty cool principles too. Perfectly good leftover food from the snack room or left by guests is boxed up and sent to Barcelona's community dining rooms plus the company also supports the Smiles from Mumbai charity helping poor families and street orphans in India. Sleeps 2 + cot in 1 x double bedroom with 1 x shower room. Living room has 1 x double sofa bed. The main beach in Barcelona is within about 40mins walk through the city centre. The property is walking distance to a range of shops, bars and restaurants. A family kit can be provided comprising high chair, cot, baby changing table and toys. For indoor play there are children's books, U-rated DVD's and a small selection of toys. Pre arrival shopping may be available on request via the apartment's concierge service. There is a cafe which offers room service. Families can also make use of a 24-hour snack room. The apartments are single storey so stairgates are not needed within them.